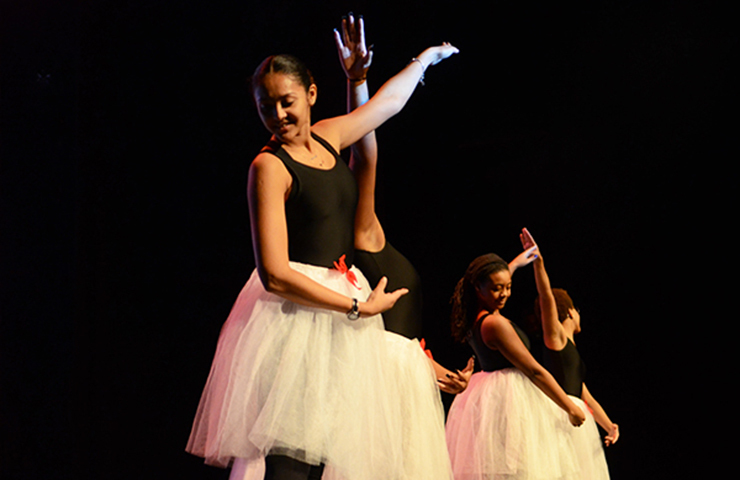 The Holiday Dance Assembly will come to Walton Auditorium on Friday, December 14 at 10:25 a.m. The Dance Studies and Performance Classes are excited to present the 2018 Holiday Dance Assembly to the George School community on Friday, December 14 at 10:25 a.m.
More than thirty-one students ranging from beginners to accomplished dancers will be on stage during the forty minute assembly. “In each dance selection students have the freedom to contribute some of their own choreography,” said Barb Kibler dance teacher. This year’s musical choices include Christmas Hip Hop Beat (TINI MC) to The Nutcracker Suite interpreted by the Les Brown Orchestra and Hallelujah! as interpreted on the soundtrack, A Soulful Celebration. Students in Scott Crandall’s stagecraft class have also been working on the staging, lights, and sound for the performance. The Holiday Dance Assembly is free and open to the public.